WASHINGTON, D.C. – Today, members of the Western Caucus released statements applauding Acting EPA Administrator Andrew Wheeler's successful testimony before the Senate Committee on Environment and Public Works. 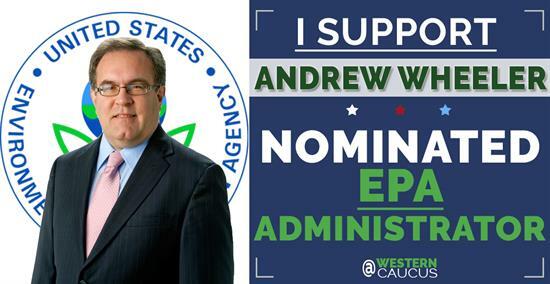 Chairman Paul Gosar (AZ-04): "As Acting Administrator of the Environmental Protection Agency, Andrew Wheeler has been a champion of our issues; issues that are of great importance to all Americans. His track record on energy, the environment, deregulation, the rule of law and science-based decision-making is exceptional. His leadership in seeking to repeal WOTUS and rewrite a new definition of the Clean Water Act consistent with the Constitution is important to farmers, businesses and rural communities. His excellent testimony and performance before the Senate Committee on Environment and Public Works only further solidifies my support for him. I fully expect that he will be confirmed. In the meantime, the Western Caucus will continue to work closely with him and the agency to carry out the important work needed on behalf of the American people." Chief Regulatory Reform Officer Andy Biggs (AZ-05): "I applaud Acting Administrator Wheeler for his successful nomination hearing today. He has been a terrific ally of the West. President Trump’s EPA, under Administrator Wheeler, has, in the past year, cut over a dozen onerous regulations, saving Americans almost two billion dollars in regulatory costs. I hope the Senate quickly confirms him, and I look forward to working with him throughout the 116th Congress." Rep. Doug LaMalfa (CA-01): "Administrator Wheeler has done a tremendous job since being appointed by President Trump to lead the EPA. He has instituted commonsense changes to misguided environmental policies, such as WOTUS, and replaced them with rules that are both more effective at protecting the environment and more easily complied with. I congratulate Administrator Wheeler on his official Senate nomination hearing today – his decades of experience with environmental policy will serve the nation well." Rep. Bob Gibbs (OH-07): "Acting Administrator Wheeler is the right person for the job. He has the experience and knowledge to fairly and competently oversee and direct the mission of the EPA. Having seen the heavy-handed, sometimes illegal actions of left-wing activists when put in charge of the EPA, I know Andrew Wheeler will be a partner with state and local environmental agencies, rather than treat them as adversaries like the Obama Administration did. I urge the Senate to complete their process to confirm Wheeler without delay." Rep. Debbie Lesko (AZ-08): "Acting Administrator Andrew Wheeler is the right choice to lead the Environmental Protection Agency. He’s proven himself as the Acting Administrator and has the knowledge and qualifications to head this important agency. I congratulate him on a successful hearing today and urge my colleagues in the Senate to swiftly confirm Mr. Wheeler as Administrator of the EPA." On Wednesday, the Senate Committee on Environment and Public Works held a hearing entitled, "Hearing on the Nomination of Andrew Wheeler to be Administrator of the Environmental Protection Agency." Acting Administrator Andrew Wheeler elaborated upon his qualifications that warrant his confirmation by the U.S. Senate. On July 5, 2018, President Donald J. Trump announced the appointment of Andrew Wheeler as the new Acting Administrator of the Environmental Protection Agency. Mr. Wheeler had previously been confirmed by the U.S. Senate as the EPA Deputy Administrator on April 12, 2018.